I've played the original Final Fantasy at least a dozen times over the past two decades. I've played the original NES game. I've played it on Game Boy Advance. I've emulated it. I've played it on my iPhone. Not once has anyone took me aside and said, "Hey man, good job crossing that bridge." Until now. 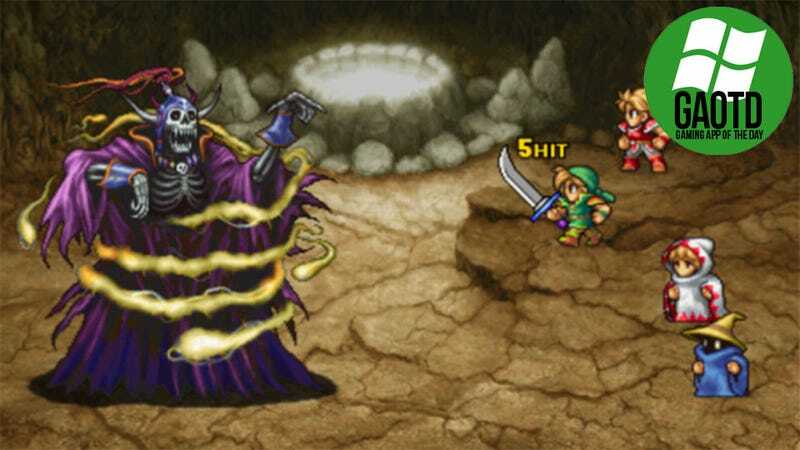 Final Fantasy finally came to Windows Phone 7 last month, bringing the updated graphics and additional dungeons of the PSP version of Square's role-playing classic to folks that own Microsoft's answer to iPhone and Android. The four warriors of light arrive just in time to save the world from grave peril, taking on evil one turn-based battle at a time. With two incredibly important exceptions, this is no different than the excellent iPhone port Square Enix released in 2010. What's different? For one, it costs $6.99 instead of $8.99. Now I'm not some sort of achievement addict, hunting down games with easy-to-acquire points to inflate my Gamerscore beyond that of my colleagues. I don't need validation for my performance. I don't need a game to pat me on the head and tell me I'm a good boy. But it's so very nice. "Cross that Bridge" isn't hard to achieve. After the initial tiny dungeon your four characters are rewarded for saving the king's daughter by having said king order the completion of a bridge he was working on anyway. It's always struck me as a silly quest reward, akin to me rewarding someone by buying myself a new car and giving them a lift. But now it's more than that. It's five. I saved the princess, and I get five. I kill 100 monsters, and I get another five. By the time I finish Final Fantasy for the umpteenth time, I will have earned 200, and I'll have a lasting record of doing so. That beats having someone else's bridge built any day.